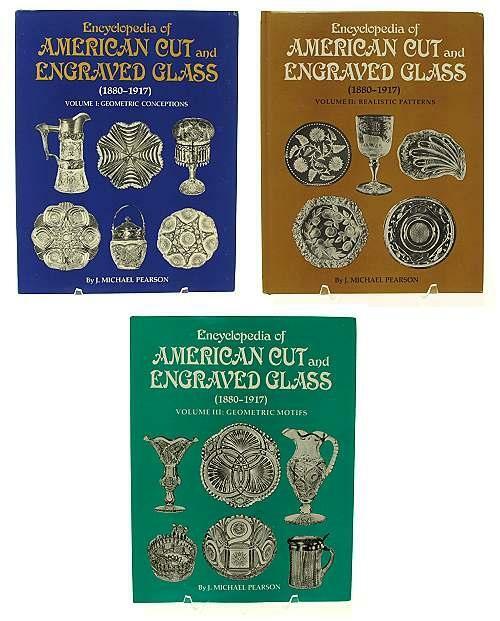 This 3-volume set, titled "Encyclopedia of American Cut and Engraved Glass" by J. Michael Pearson, is invaluable to the collector and student of American Brilliant cut and engraved glass. SINCE PUBLICATION OF THE BOOKS IN 1975, '77 AND '78, THE AMERICAN CUT GLASS ASSOCIATION (ACGA) HAS PUBLISHED OVER 35 CATALOG REPRINTS WHICH HAVE MADE MANY ADDITIONAL PATTERN IDs POSSIBLE. Using these catalogs and other sources, Paul Miles and his many friends have compiled a list of over 300 previously unknown identifications for these three volumes. These new identifications are essential to a more complete and accurate reference library. The 300 identifications, plus a pattern index by cutting house (ten pages in all) are included with the 3-volume set. We currently have a used set of the three-volumes.